An easy cardigan that could very well become a staple in your wardrobe. The measurements are a little tricky – they indicate a larger size but when worn, the cardigan drapes around the body in a very flattering manner. The cable pattern only allows for two sizes; one to fit a Small to Medium and one size to fit Large to X-large. 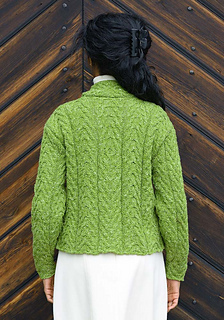 If you can knit cables this is easy knitting with very little shaping. The pattern, reminiscent of tree bark, is knitted from the chart and different gnarly structures are created by shifting between the upward striving and the downward striving cables. These shifts are indicated in a schematic but, if you are creative or adventurous, you can make your version unique by placing the shifts wherever you want.